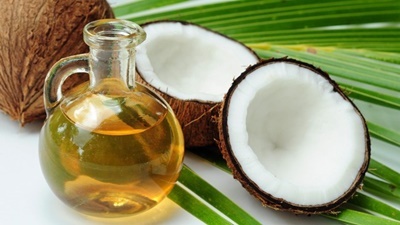 Once upon a time, many people avoided coconut oil because of the large concentration of saturated fats but now it seems to be the new “health food” that’s creating buzz. People use it to cook, add it in their coffee, even rub it on their skin and hair for the supposed health benefits. So is this once vilified oil now the holy grail of fats? To find the answer, we are going to have to dig a little deeper. Today most people know that fats are a vital component of diet but are still often the first thing cut out when dieting due to its caloric density. It may be wiser to cut down the carbs first because carbohydrates are much less “essential” to our body. Our bodies are largely made of fats, and there is a phospholipid component to every cell in our body so we must have an adequate amount of dietary fat from healthy sources. Fats also help regulate many hormones, enable the absorption of fat-soluble vitamins, and are a structural component of the myelin sheath in our bodies transporting all of our nerve impulses. Safe to say fat plays a large role in helping our bodies function optimally. While most agree dietary fat is a necessity, people are often advised to consume unsaturated fats and avoid saturated fats. To get a better understanding of saturated fats, let’s look at the chemical structure of what makes a fat. When a fatty acid is “fully saturated” with hydrogen atoms they contain no double bonds. Monounsaturated fats contain one double bond while polyunsaturated fats contain two or more. Saturated fats are less vulnerable to oxidation since they lack double bonds, which are prone to instability when under heat. When an oil oxidizes, it reacts with oxygen and forms various harmful compounds known to be carcinogenic and inflammatory. 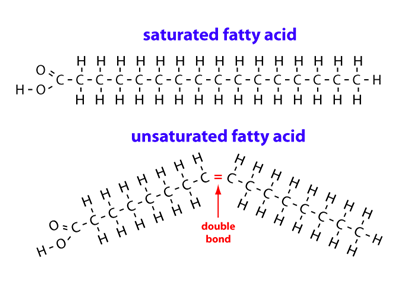 The more double bonds, the more unstable the fat, when reacting with heat. This is why coconut oil is a good choice for cooking at higher temperatures. For years, the diet-heart hypothesis was preached by many health advocates. This is the belief that consuming saturated fats leads to an increase in cholesterol, which causes heart disease. This was largely based on early studies involving rabbits where heart disease was induced by feeding them large amounts of pure cholesterol. The problem with this is that rabbits are herbivores and lack the ability to self-regulate endogenous cholesterol like omnivores and carnivores can. There were also some poorly designed early human studies pushing the belief saturated fat was to blame for heart disease. In the last 50 years, numerous better-designed studies conclude saturated fat is not a causal factor of heart disease. There have been two extremely large meta-analysis studies involving over half a million participants showing zero correlation between saturated fat intake and heart disease. (1,2) What we now know is saturated fat consumption will not cause atherosclerosis but it will likely increase cholesterol. However, it is the HDL-c or “good cholesterol” getting the larger boost than LDL-c, which has been linked with heart disease. Even the increase in LDL-c is not really a negative since the LDL particles become larger and more “fluffy” and less damaging to arterial walls (3) The boost in HDL helps your body fight systemic inflammation and is a building block of testosterone. Multiple studies have shown higher levels of testosterone can be obtained through consuming larger amounts of saturated fats. (4,5) It appears saturated fats are an essential part of nutrition and muscle building. They are not to be feared, so there is no reason to avoid coconut oil. But you can get saturated fats from many other sources like animal fats, butter, and cheese so why is coconut oil being touted over the rest? Coconut oil is often touted as a food promoting weight loss because of its “high concentration” of medium chain triglycerides. MCT’s differ from other fatty acids in the way they are absorbed providing immediate energy and minimal fat storage. Most fats require a large amount of bile and enzymatic processes for digestion. This long digestive process also makes these fats more prone to be stored as adipose tissue as they must pass through the lymph system before making their way to the liver. MCT’s are easily absorbed directly into the bloodstream, so they bypass the lymph system, so they do not have a chance to be stored as fat. Instead, they are taken directly to the liver and converted to ketone bodies for immediate energy. These ketones will be utilized for energy output similar to the way our body uses glucose in the blood. 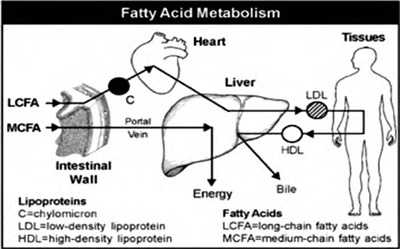 This diagram illustrates how MCT’s are digested and converted to energy compared to long chain fatty acids. This conversion to energy provides a thermogenic effect boosting metabolism(6) and promotes satiety. (7) MCT’s have also been shown to improve insulin sensitivity and glucose regulation (8) helping minimize fat storage. So consuming MCT’s while in a low carb state is an excellent way to keep workout intensity high, preserve lean muscle while turning on the fat burning machinery in your body. Many people practice intermittent fasting in the morning promoting fat loss and other health benefits using only MCT’s for breakfast waiting until lunch for their first meal. Supplementing with BCAA’s during this fast helps preserve lean muscle mass when you are in a large caloric deficit. Proponents claim coconut oil has a high concentration of MCTs with 60-90% of its content coming from the 8, 10, and 12 carbon medium chain fatty acids. While this may make coconut oil seem like a great food to use as a supplement when dieting, the truth is you are getting very little “real” MCTs in that large percentage. In fact, it's closer to 10-15% of usable MCTs instead of 60-90%. The reason companies can make this claim is because the 12 carbon chain fatty acid, lauric acid, is classified as MCT but it does not function biochemically as an MCT. This means the digestive process is different and lauric acid is processed just the same as other fats lacking similar metabolic benefits provided by the 8 and 10 carbon chain fatty acids. While lauric acid is a healthy fat providing immune boosting benefits, when looking to gain the fat loss benefits of MCT supplementation we are only concerned with 8 chain caprylic acid and 10 chain capric acid. MCTs have been used by bodybuilders since the late 70s to preserve lean muscle mass while promoting fat loss during contest prep. Instead of trying to get high doses of MCTs from coconut oil, consider trying a concentrated liquid version (containing only the 8 and 10 carbon chain fatty acids) in your early morning coffee or tea. Combine this with something like Sheer Thermo and you will be in pure fat-burning state until your first meal. Production of monolaurin when enzymatically broken down. This is a powerful immune boosting compound that helps fight pathogens and harmful bacteria in the body. It’s also able to improve dental health and eliminate bad breath when used as mouthwash. Coconut oil should be included in everyone’s diet and provides a wide array of healthy saturated fats fighting inflammation and promoting optimal hormone production. It is a big immune booster thanks to the high concentration of lauric acid from the conversion of monolaurin during digestion. If cooking at high temperatures coconut oil will be more stable and less prone to oxidation than monounsaturated and especially polyunsaturated fats. You can even use it as a natural sunscreen or lotion and apply it to your hair to keep it from drying out and fraying. Coconut oil may have all these benefits, but the often hyped fat-burning properties that come with its MCT content is quite overblown. You won’t get any substantial amount of the real MCT’s, capric and caprylic acid. In fact, you would have to ingest about six times as much coconut oil to equal what you get in concentrated MCT oil formulas. So use coconut oil in all your cooking endeavors and feel free to put it in your green shakes and smoothies. But consider using concentrated MCT oil in your morning coffee instead of regular coconut oil if you want the thermogenic benefits that come with fasting while using MCT’s.